Some places like Ontario, where I live, have disability access laws that state service providers, including those in healthcare, must accommodate people who are disabled. When we think of barriers to accessibility, most of us think of physical barriers — like a person who uses a wheelchair not being able to enter a public building because there is no ramp. • Attitudinal barriers are those that discriminate against people with disabilities. • Organizational barriers are an organization’s policies, practices or procedures that discriminate against people with disabilities. • Architectural and physical barriers are features of buildings or spaces that cause problems for people with disabilities. Chemical or “environmental” barriers prevent people like myself who have disabling medical conditions from breathing and functioning properly when exposed to these invisible, toxic and disabling barriers, resulting in both short and long term impacts. How many of us do not have safe access to healthcare in Ontario? • The provision of goods or services to persons with disabilities and others must be integrated unless an alternate measure is necessary, whether temporarily or on a permanent basis, to enable a person with a disability to obtain, use or benefit from the goods or services. Many people with MCS/ES and/or respiratory diseases suffer disabling symptoms when exposed to polluted air. We require safe (low or no VOC) indoor air, and that means the people inside also need to be fragrance-chemical free. My local Community Health Center refused to provide safe for me accommodations when asked. 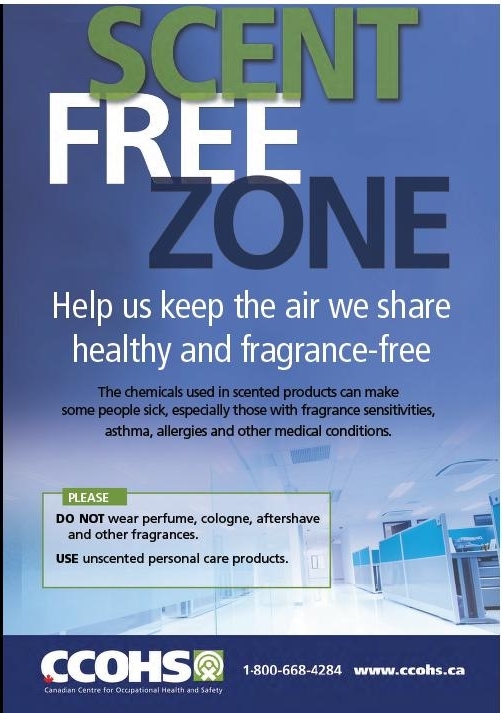 Recently I discovered that the Association of Ontario Health Centres promotes a Scent-Free Workplace but perhaps they don’t require that their members comply. Med Visit, a service that has doctors on call to do home visits, has repeatedly refused to ask if any of these doctors are already fragrance free or are willing to become fragrance-free. I was told they treat everyone equal, that I could call in every morning like everyone else does, and that the doctor on call would phone me back and I could ask them if they were fragrance-free. I said that I could be calling every day forever if none of them actually were fragrance free, and suggested that it would be far easier if they find out before I go to all that trouble for nothing. They did not tell me I lived out of their service area then, when I 1st called, but later claimed they only went as far as the highway exit north of me when I sent in the official request. • “Equal opportunity means having the same chances, options, benefits and results as others. In the case of services it means that people with disabilities have the same opportunity to benefit from the way you provide goods or services as others. They should not have to make significantly more effort to access or obtain service. They should also not have to accept lesser quality or more inconvenience. This lack of access to health care is impacting my life in many ways. For one, I am not able to receive disability related benefits I’m entitled to because I can’t find someone qualified to sign the new forms ODSP created, despite having it on record from previous doctors what my needs are. This is yet another place systemic discrimination is in effect. Whatever happened to “do no harm”? How is this equal access to public health care? I need access to medical professionals who preferably have at least some understanding of environmental health issues, and are also fragrance-chemical free. Until health care environments are free of chemical barriers that make it impossible or harmful for people with MCS/ES to access health care there, perhaps we need to have the enforceable right to safe health care brought to our homes when it’s not safe for us to go there? Seems I have the right… But if no-one is willing to provide the service, what good are “rights”? Perhaps I need a lawyer? Is Eli Stone around? How can I get safe access to healthcare? 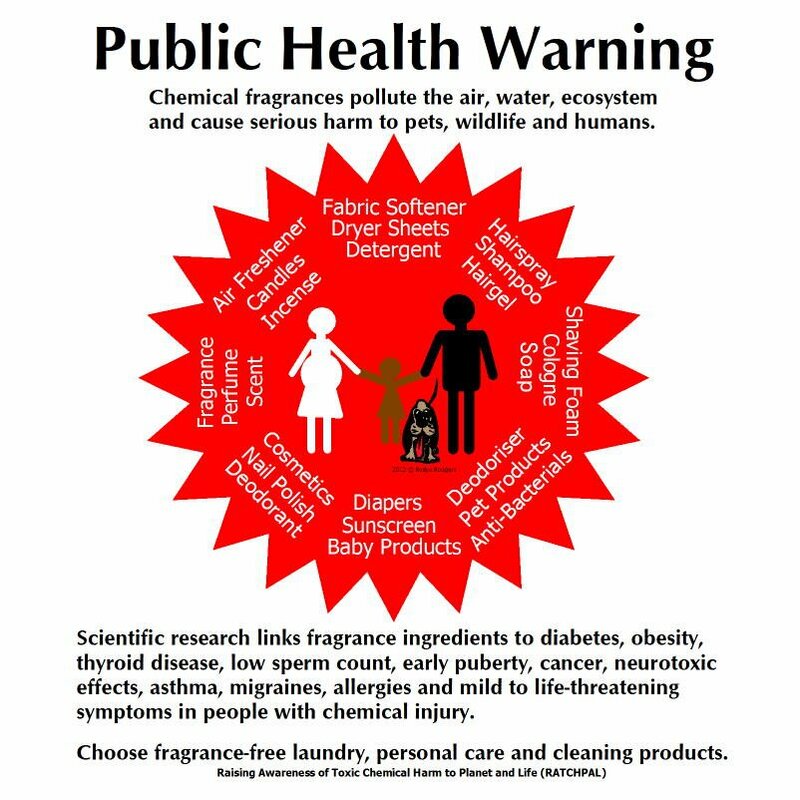 Please see my post “Air Quality and Accessibility in Health Care; Why Aren’t All Health Care Providers Fragrance-Free?” for resources in addition to the ones below on fragrance free health care environments and how to create safe environments for those of us with MCS/ES. This entry was posted in Disability, Government, Health Care, Human Rights, Multiple Chemical Sensitivities and tagged Accessibility Standards for Customer Service, AOHC Scent-free, Fragrance, health care access for people with MCS/ES, health care discrimination, MCS/ES, MCS/ES systemic discrimination, Med Visit, National Access Awareness Week Ontario 2012, ODSP, safe health care. Bookmark the permalink. Linda, would you have any better chance of getting cooperation using CFS as a diagnosis instead of MCS? I don’t think so. I’d still need a fragrance-free home visit. And people with MCS/ES are not the only ones without access to appropriate health care. Here’s a petition with an excellent description of what ME/CFS is, and how they too do not receive appropriate health care here in Ontario (and I’m sure elsewhere too). 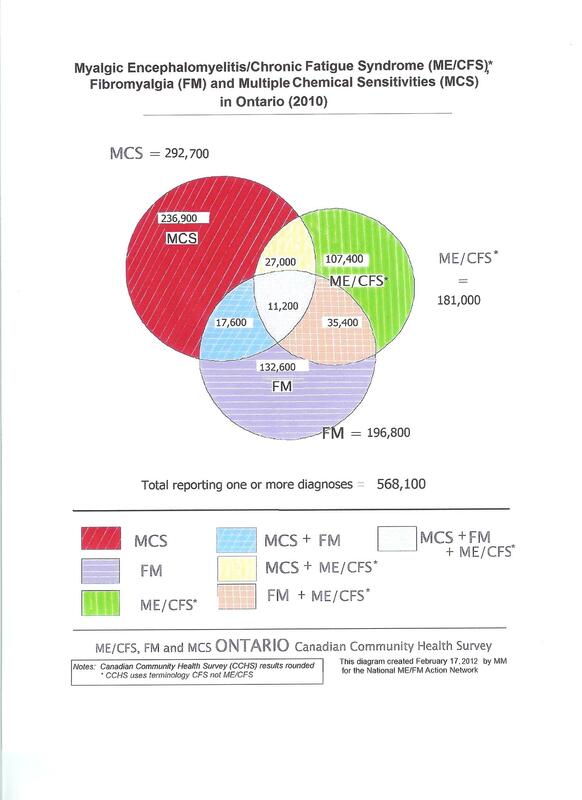 (Many people with ME/CFS also have some degree of MCS, as is noted in the chart above). Please read and sign this petition if you want to make this change. Even though it doesn’t seem right that a petition is needed for necessary healthcare, until we have lawyers fighting on our behalf to enforce our rights, this might help raise awareness for the need. The key is that absolute cures are available. I don’t understand your comment? What does this have to do with discrimination? Discrimination is rampant against people with all kinds of disabilities. It’s terrible, of course. (MCS sufferers are somewhat unique because they are specifically protected in Ontario under the Human Rights Association. But my point is this…it is not always necessary to endure some medical conditions, including MCS, when complete cures are available. I sought out and found my cures years ago, but have been steadfastly prevented from reaching sufferers with my message due to the intervention of MCS moderators. Why don’t you start your own blog where you can describe in detail the methods you used to cure yourself? It doesn’t cost anything to do so and you could reach an interested audience by doing so. With MCS/ES, people need to keep in mind, as Pamela Reed Gibson has demonstrated in her research, that not everyone with MCS/ES will be helped by the same methods as the next person. Access to trained and knowledgable health care providers would make a difference here too. Also, there are many roads to chemical injury, and fewer roads out. The 1st and foremost thing is avoidance of harm. How can people avoid harm when they can’t even get the correct diagnosis and medical advice? To avoid further harm means living (and working if able) in a trigger free environment. Then what we drink and eat is of utmost importance > garbage in, garbage out. Healthy, nutritious organic foods can heal. Fast food, processed food, junk foods will just keep us sick (and not just with MCS/ES). If we have access to the same level of medical and social supports as other people, we would be better able to travel the path of healing. If we have not had access to proper diagnosis and accommodation at work, or in our (shared) living arrangements, and become too ill to work and can’t move to a safer environment because we can’t afford it, or because it does not exist, we also cannot afford the basic treatments we need and our health and abilities can deteriorate to severely disabling states. This is something that is not written about in official papers. I write mostly from the perspective of someone whose MCS/ES became so severe due to circumstances beyond my control, that I almost died. I was not able to receive any of the supports I needed, and was subjected to exposures when my body was no longer able to tolerate them, so my health was severely compromised. Although not officially diagnosed, I also have all the symptoms of toxic brain injury and many MS symptoms as well, so all my experiences will not be applicable to those with milder MCS/ES. I am slowly healing now because I was fortunate enough to receive one of only 7 housing units in Canada that were built for environmentally sensitive people, and my body tolerated the unit (some do not), plus I have spent all my basic needs income on organic food and supplements instead of other things. I also stimulate my brain in a number of ways to increase plasticity and functioning, instead of passively watching tv. I work hard for my health. If I were to go to a doctor’s office, I would be exposed to so many of the chemical substances that disable me, that I’d lose a lot of the health I have worked so hard to gain, and could become too disabled to get up and down the stairs here (my bedroom and bathroom are upstairs and kitchen is downstairs, so I need to be able to manage the stairs)… And because I cannot get to a doctors office to get certain papers signed, I cannot receive further benefits I’d be entitled to that would help me heal even more, and so progress is systemically denied. What I need now, for my health to continue to improve, is a medical professional who will sign some papers for ODSP for me. I already have in my files a number of detailed papers and prescriptions from past doctors, but ODSP changed their forms and won’t accept the previous ones. Since I can’t go to a doctor, I need one to come to me. According to the law, this seems to be a possible solution, but so far, no-one wants to follow this law. I need someone willing to buck the system and their habits in the name of providing health services. That shouldn’t be too much to ask for? Thank you for your suggestions, Linda. My personal goal is to achieve some progress in the courts; perhaps a class action lawsuit. There are a number of identifiable streams of indifference to some kinds of health sufferers. None of these can have preference over another. MCS may be considered as belonging to auto-immune illnesses. I also suffer from Hashimoto’s Thyroiditis which is another auto-immune condition. Very few MD’s even know how to test for Hashimoto’s, and so I was misdiagnosed and untreated for many years. Instead I was mislabeled as “bi-polar,” one of countless mis-classifications from the junk realms of conventional psychiatry. The psychiatric medications I took as a result, was a major cause of my MCS. So then I was arrogant enough to figure all of this out; research and choose my own treaments. My mood swings ceased when I stopped all drugs and avoided chemicals, but it took special treatment for my MCS. An attendant condition, which in the literature, sometimes accompanies MCS is ES. (Electrical Sensitivity.) I found a simple cure which cured my ES; a homepathic remedy called CELL-900 HZ, 30 CH. Many people have been cured of MCS through EPD (Enzyme Potentiated Desensitization.) Drs. Zazula and Krop in Mississauga, Ontario, were administrating this treatment; also Dr. Greenberg in Vancouver. I took the treatment for only 18 months of a 3-year term, so it was only half-successful. The normal success rate is 95% and I can vouch for that. EPD was also practised in the States but eventually banned by the FDA. An MD who practices Orthomolecular Medicine diagnosed an extremely low magnesium condition. Solved by taking high doses of calcium-magnesium for 6 months. I then self-diagnosed with CFS, found instructions on a cure by Dr. Garth Nicolson in the States, for the antibiotic cure, and took antibiotics for 6 months. No problem as I took them with acidophilus, and suddenly at age 62, I had all this energy, for the first time in my life! I am now symptom free, with one major exception. I cannot tolerate doctors’ or hospital’s waiting rooms where the ventilation is poor. I seem to react to the accumulated, exhaled pharmaceuticals in the air! Regarding treatments, we should have access to those that help, like the ones you mentioned and others, and they should be covered by OHIP. That’s another area of discrimination. The treatments you describe are not unconventional as far as treating MCS is concerned, and the extended antibiotics are what helps those with chronic LYME disease. (IN 1985), “I chaired a committee on environmental sensitivities established by Ontario’s Ministry of Health. The committee included two eminent teaching hospital physicians and a highly respected epidemiologist. We issued a report that identified existing, publicly funded means of diagnosis, and accepted various methods of patient management, including avoidance of offending agents. Considering almost 30 years has passed since that very thorough report was issued to the government of this province, one would have expected to see more progress. You had mentioned that those treatments were not unconventional, but as far as the mainstream ‘conventional’ medical system is concerned, these treatments and indeed all work performed by homeopaths, naturopaths and indeed the sale of natural health products should be outlawed, according to their advocates. Sadly they are making progress in this direction both here and in Europe. Can USA residents sign the petition? I think everyone can. You can add a comment too as to why you are signing. I just learned that it is National Access Awareness Week and the Province of Ontario hasn’t even bothered to recognize this like they have in past years. It would help if they were serious about enforcement and had an office that provided appropriate education for those who are unwilling to comply without some encouragement. I know you’re in a different country, but I thought I’d send along this sign of potential progress in the making . . . .